OMAHA — September 16, 2018 — Growing up in Brazil, Mariana Oliveira was drawn to dance at an early age, stepping into the studio as a four-year-old to take her first ballet class. Years later, Oliveira had the opportunity to continue her ballet training in London, eventually accepting a traineeship at National Dance Company of Wales. At age nineteen, Oliveira was invited to perform with Cuban Classical Ballet of Miami. She was more interested in the creative process. So Oliveira moved to New York where she encountered the work of another female choreographer, Aszure Barton. Oliveira came to Omaha last month to stage the hauntingly beautiful ballet, Death and the Maiden, one of several guest pieces featured in American Midwest Ballet’s upcoming production, Momentum: Rhapsody in Blue. While visiting Omaha, Oliveira took some time to talk with us about her life, her work, and her inspirations. 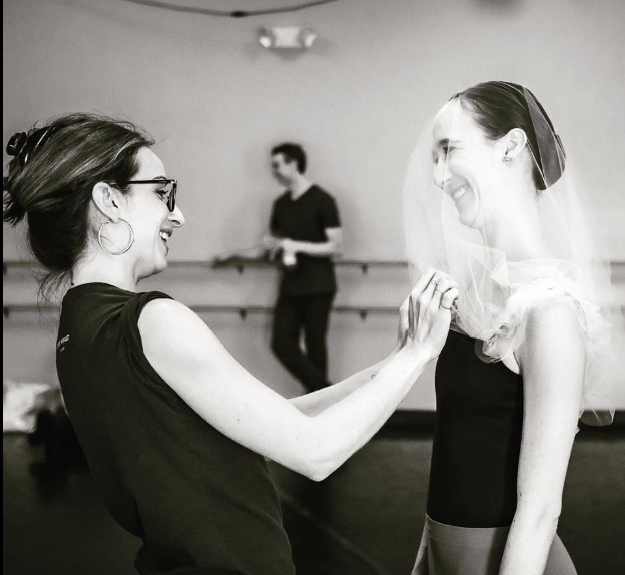 Can you share a bit about the piece you are staging on American Midwest Ballet dancers? This piece portrays the agony and the comfort of death, and the vulnerability and awareness of life. Death and the Maiden is based on the poem written by German poet Matthias Claudius, which inspired the composer Franz Schubert to compose in 1817 his String Quartet No. 14 in D Minor, also known as Death and the Maiden. What is special to you about Death and the Maiden? Death and the Maiden was originally created two years ago for the trainees at Joffrey Ballet Studio Company. It was my first commission outside my per project based company, and after that, many doors were open for me. This piece has a very special place in my heart. So many of the dancers in the original cast now work for companies worldwide, such as Netherlands Dance Theater, Boston Ballet and many others. 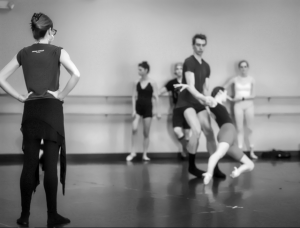 So being part of the trajectory of young dancers starting out is very gratifying. Mariana Oliveira shares a sweet moment with her maiden, Alexandra Hoffman. For many choreographers, the first inspiration for a new work comes from the music. Is that true for you? It depends . For some pieces, the inspiration comes from the music and the concept unfolds from there. But other times, the concept comes first and I have to search music that will fit better. As an artist, I reflect on my moment. Each moment of my personal life somehow ends up on stage. And by expressing this moment through movements, I learn a bit more about myself. What appealed to you about Franz Schubert’s String Quartet No. 14 in D Minor ? I heard the music on the radio and I was immediately in love with it. Then I researched about it and everything made sense. Franz Schubert was very sick when he composed this piece. It was one of his last works; he died very young. So he was, in a way, having a conversation with death. What is the story of Death and the Maiden? This piece is a reminder of how fragile life is; how important every moment is; and how every person that crosses our path has a impact in our lives. What do you hope to convey to the audience or hope they take away after seeing this work? As an artist, you express yourself in your moment — and once the work is done, it doesn’t belong to you anymore. The audience should embrace it as they wish. If it touches them in a personal level, it’s lovely and magical. But that’s a very individual experience and it cannot be controlled. The women in my family had — and continue to have — a huge impact in my life and art. They broke many barriers to keep their dreams alive. Their strength and resourcefulness are a constant reminder to me [to do the same]. I’ve been so moved by the work of composer Heitor Villa-Lobos and his dedication to his craft. He composed over 2,000 works by the end of his life. That form of dedication and sacrifice inspires me. I’ve created three different works based on his composition and I can’t wait to continue this exploration. I also try to look outside of dance to be inspired. To me, inspiration comes in different ways and at different moments. It all depends on what’s happening in my personal life, so that will inform the type of art that will inspire me or which artist will touch me in a deeper level. How have you grown artistically from your years as a student, to trainee, to professional dancer to choreographer? I think my life is a constant search for answers. I’m always learning, especially from dancers I get to work with. They are my favorite people in the world and they make me a better person. What makes me grow artistically are the people that cross my path. Coffee and silence. Who knows? Each Monday morning is different. I wouldn’t tell [laughs]… it wouldn’t be a surprise anymore. There is so much to achieve! As an artist you can’t be comfortable. There is always so much to learn and so much to explore. I just want to continue doing what I do. What was the best advice you’ve received? Nothing is forever. Life is a constant transition. 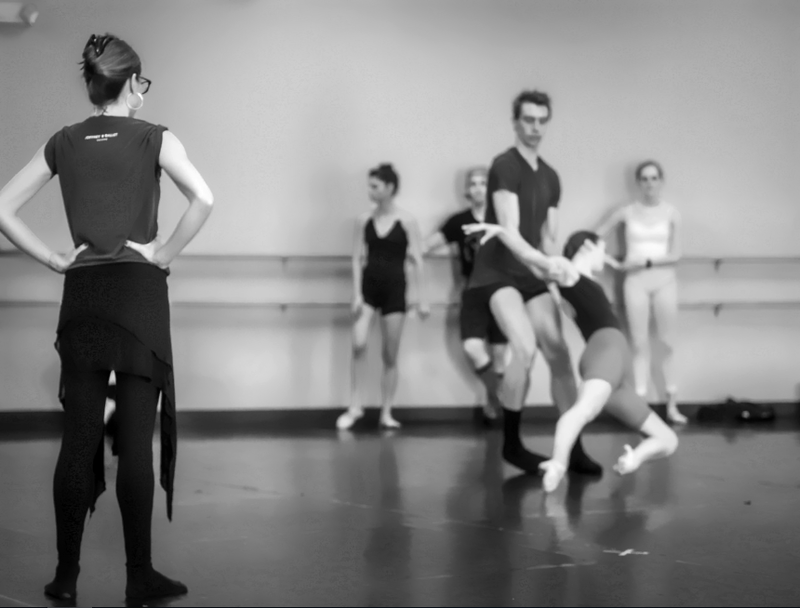 What advice would you share with young dancers and choreographers starting their careers? Especially for women in choreography — never take no as an answer! A “no” should be used as a fuel to persistence. Never let people put you inside a box and dictate who you should be or what you can achieve. Mariana Oliveira’s Death and the Maiden is among the featured works in American Midwest Ballet’s Momentum: Rhapsody in Blue Oct. 19 & 21.